Digital tools that help map and analyze geographic and atmospheric data, weather balloons, Doppler radar, storm-chasing vehicle and equipment: the resources available to students of geography and meteorology at Valpo are superb. Classroom technologies help students visualize and understand important concepts, and students’ access to sophisticated field and laboratory equipment is extraordinary. 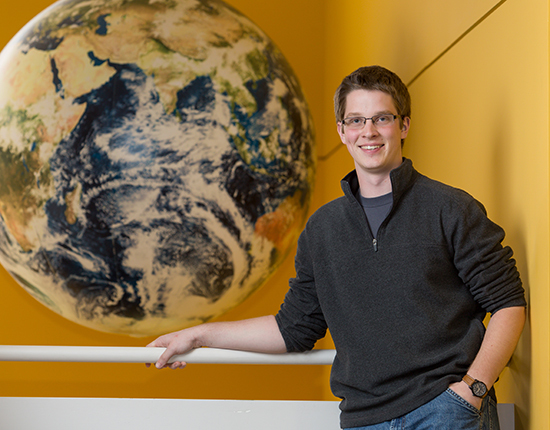 Thanks to plenty of hands-on experience, graduates of Valpo’s geography and meteorology programs are prepared to apply their knowledge. 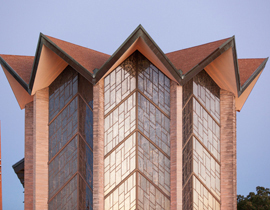 The department’s home is in Kallay-Christopher Hall, an award-winning facility that signals its connection to the weather and the world around it with its strikingly angled wall of windows. 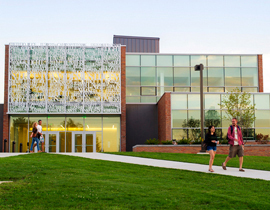 It is connected by a glass walkway to Schnabel Hall, which houses a geographic applications lab as well as television and digital media studios used by students exploring a career in broadcast meteorology. A Dodge Ram crew cab, used during summer storm chases, is outfitted with a variety of instruments during field studies. The weather observation deck, adjacent to the weather center and meteorology classrooms, offers an unobstructed view of the southern and western horizon. A full 360 degree observation of the sky is possible from the observation deck and weather center windows on the second floor of Kallay-Christopher Hall. The radiosonde launcher is also located on the weather observation deck. InterMet radiosonde launching, tracking, and data retrieval systems provides students the ability to explore the upper atmosphere. Students get hands on experience preparing and launching instrumented weather balloons from the weather observation deck or in the field. Data from the instruments are used for coursework and student research. Hands on demonstrations of fundamental physical principles such as rotation and angular momentum, circulation and thermal wind principles are brought into the classroom with the Weather in a Tank apparatus. 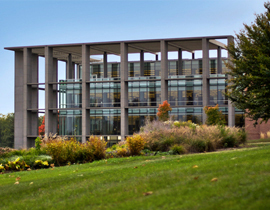 Located in nearby Schnabel Hall and connected to Kallay-Christopher Hall by a glass walkway, the VUTV Broadcast Studio provides the opportunity for meteorology students to put into practice the technology and art of TV weather broadcasting, whether in a classroom setting or during live broadcast sessions for VUTV. This facility, outfitted with more than 20 Windows desktop computers, provides access to powerful GIS, cartography, and remote sensing software including ArcGIS, ENVI, MultiSpec, QGIS, and Adobe Creative Suite. Located in Schnabel 34, it is open to all geography, meteorology, and environmental science majors and minors. The map collection located on the first floor of the Christopher Center includes maps from the U.S. Geological Survey, National Imagery and Mapping Agency, CIA, and Departments of Agriculture and Interior. The collection also contains National Geographic maps and maps of cities in Indiana, the United States, and the world. Located in the map cabinets in the downstairs lab, the departmental map collection includes selected USGS topographic maps for all 50 states. 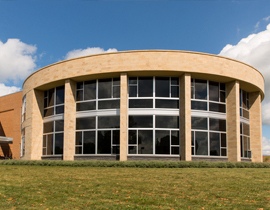 State-of-the-art classrooms in Kallay-Christopher Hall include a 60-seat tiered classroom, a small classroom with moveable seats designed to facilitate discussion, and two laboratory classrooms. All classrooms offer full multimedia capabilities and Internet access. Laboratory classrooms feature historic map cabinets. An area adjacent to the Weather Center on the second floor of Kallay-Christopher Hall provides a welcoming environment for students, featuring a wall-sized map of the world and a mobile VisBox wall-sized monitor for dynamic display of weather maps. The first floor lobby of Kallay-Christopher Hall provides a pleasant meeting and study space for students and visitors, with café tables for a quick lunch or study space, comfortable chairs and couch for a group discussion area, and real-time weather and model data updated on five wall-mounted monitors. Around the corner at the northeast entrance, a GeoChron tracks the global daylight coverage through the year. Located on the first floor of Kallay-Christopher Hall, the conference room is perfect for small class discussions, department meetings, student executive board sessions, and quiet study. The facilities are outstanding: you have all the tools you need.